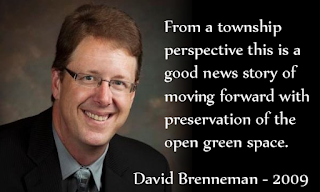 As many of you would have received a notice in the mail about Breslau Mennonite Church's plan to sever off a section of vacant land on the north and northwest side of the church for an apartment building. (Zone Change Application) What you may not know is that this apartment building is being designed for a seniors community. Now as we can't discriminate against age is it labelled as a 4 storey apartment. That being said, the marketing and the reach for renters will be exclusively geared towards healthy, independent seniors aged 55 and up. I am a member of Breslau Mennonite Church and I have been a member of the church committee working on this project since 2012. However, this committee had been working on this project for much longer than that. I wanted to take some time to explain the history of this project and how we have now come to the community once again to discuss the zoning of this land and the construction of this project. A committee was formed to address the churches mission to help and support the seniors in the local community of Breslau. The final recommendations of this committee was that Breslau Mennonite Church (BMC) should approach Forwell for the opportunity to purchase additional land around the church. Forwell approached the church and stated they were willing to sell the land that the church was requesting. At the time, this land was to be used for cemetery expansion and potential development of seniors housing in future when such a project would be economically realistic. A deal was completed with Forwell including access to BMC from the subdivision that was being planned in the area north of the church. The trustees of the church and the committee recommended purchasing the house next door for the immediate need of expanding the parking area for BMC and to increase the potential size of a seniors development in the future. BMC met with representatives from Empire Communities the new owners and developers of the Riverland subdivision. BMC requested the service opportunities as per the Forwell agreement which they honoured. Woolwich Township Needs and Capacity Survey identified an immediate need for housing geared toward seniors throughout the township, particularly in Breslau as the community was rapidly expanding. When BMC approach the township at this time they were extremely supportive of the concept. Empire Communities serviced the streets around the church which included sewer, water and storm water outlets to the property line. Church membership at this time reaffirmed the mission to build a property development geared towards seniors in Breslau. The committee became more focused on developing more defined site plans. Church consulted with professional planners and engineers on what would be feasible on the site. Through the discussions it was recommended that BMC purchase the last remaining property between the church and the Empire subdivision. This was presented to the church membership and it was passed. The church proceeded to purchase the property and the remove the buildings and decommission the lot. This allowed for more options and access to the future seniors development. The committee began to seriously solicit developers who would partner with BMC to make the 20+ year old vision become a reality. A number of developers were contacted during this time. The township held a public meeting about the Breslau Secondary Plan. The plan presented at this meeting and as part of the over all plan it stated that the lands outlined by BMC for the seniors housing development were pre-zoned as medium density residential. BMC held an open house meeting at the church providing an update to some of BMC new neighbours. BMC was concerned that since many new residents of Riverland had moved in to the new subdivision they may not have been aware of this project. Flyers were distributed throughout the subdivision specifically to the houses that were backing onto BMC property. At this meeting BMC indicated that a small field of new trees that had been planted several years earlier would be available to the residents of Breslau if they were looking at creating a natural barrier between the seniors development and their home. This meeting was attended mostly by hopeful seniors who were looking for a chance to stay in Breslau in their later years. Many questions were asked about the size of the units, how many units would be available, parking, etc. Several of BMC new neighbours were concerned about the loss of the natural space that they thought they were living beside. Various iterations of the Breslau Secondary plan are discussed some of the versions had a potential school located behind the church and others had possible commercial or medical facilities. All plans during this time still stated the church lands as medium density residential. Formal applications were made to the township to continue the development. BMC wanted to have township sign off before formalizing a relationship with a developer. However, there where many applications relating to Breslau at that time (Thomasfield, Empire, Smart Centres, etc.) and the secondary plan was being contested. The township also informed us of cross border servicing agreements with Kitchener needed to be worked out. BMC cautiously continued talking to potential developers knowing that they would not be able to formalize a relationship until the secondary plan was fully in place. A developer was selected as a partner in good faith who had developed these types of buildings before and had experience with setting up and maintaining them. The committee and the developers planners passed plans and priorities back and forth. BMC was then faced with a decision to sever off the land and sell to a developer, or hold the land and become a full partner with the development. Throughout many discussions it was decided that BMC would sell the land to the developer pending various conditions. The offer of purchase was accepted both by BMC and the developer after the developer conducted various tests on the property. The developer came back to BMC with what they decided was a viable project plan. The develop came back to BMC with a site plan for a 4 story apartment at the back of the property with a parking lot between the building and the edge of the property line to try and minimize the impact on the new houses that were built by Empire Communities. In order for the developer to officially break ground and begin construction a finalized zoning change was required. For everyone who has concerns or would like to learn more about this process there will be a public planning meeting occurring at the Township Council in Elmira the meeting begins at 7:00pm. That was a long piece of history to help you understand that this isn't some developer who is just trying to cram more people in Breslau. This is not the township trying to make Breslau into some type of urban jungle. This has been a meticulously thought out and scrutinized plan that has been a mission of Breslau Mennonite Church for 30 years. This project is specifically and directly geared towards seniors who have spent their lives building and defending Breslau. Those healthy seniors who no longer want the responsibilities of the large properties they live on but want to stay connected to their community. This project is a thank you to them and a sign of deep respect that they are valued members of our community. Now just like all projects I know there is a voice out there of people who do not want this project to go forward. I respect their voice and I respect their opinion. I also understand that a petition that has been started on Change.org to protest this project. If I have not convinced you otherwise and you don't want this to happen then you should visit their petition and voice your opinion. I have read through some of their statements and frankly, I disagree. This project is directly in the character of Breslau supporting those who have build our town. Were you not moved by the support of Herb and his team when they were generously granted a free lunch by members of our community. Many more members of the Breslau community are just like Herb as they have poured their heart and soul in the place that we now get to enjoy just for moving in a few years ago. This project isn't for you, it is for them! This project will not be an eye sore, the church has painstakingly vetted developers who will realize our vision. We as a church will be living beside this building just as close as you and we can't move out. It is in our best interest to make sure it is a beautiful building. Considering that BMC bought and took down two older properties on Woolwich street that were not in the best repair, the comparison to what will be built is a bit of a silly one. In addition, this building is intentionally being set back away from Woolwich street for a safe place for seniors to get themselves in and out of their homes. I am sorry that you moved into your property without realizing that the land behind you was not designated green space or a park. I am sorry that the developer didn't mention that as far back as 2012 it was deemed to be future medium density. I am sorry that your view will be altered, but I must say your house has altered the view that we have had in the church but we knew you were coming and we welcome you to our community. The church still has strong young trees that we have offered to residents in the past and if you are interested in getting a tree please let me know and I can get you in touch with people who can make that happen. I am not a realtor so I can't say anything about property values and how a seniors building would affect them. What I can tell you that if the church did not purchase these three different properties back in 1989, 2002, and 2012 then you would be backing on to houses anyway. I obviously strongly support this project and I am will to talk with anyone about their concerns. I personally don't know whether a 4-story or 3-story building or something else is the correct type / size of building to put in this space but to care for our earth is to intensify our residential spaces where appropriate. We are in a growing community and as we grow our residents age, if not here in this building in the heart of our community then where do you recommend they go? If they can't take care of a property on their own what do you recommend they do? This project keeps families together and keeps friends and neighbours together. I believe in the churches vision and I again believe in something that benefits us now and in the future. This past Sunday (April 24) the Township of Woolwich held an open house at the Breslau Community Centre Gym. There were many representatives from the township present including most of Council, the Mayor and senior members of township staff. I know that I had very good conversations about the parks, Menno Street, soccer, traffic and the potential of a Breslau library branch. Most importantly, I was interested in how we as a community can work together with the township to improve where we all live. If you did not have a chance to participate in these discussions the township has posted an online survey that you can use to respond: http://woolwich.survey.esolutionsgroup.ca/TakeSurvey.aspx?SurveyID=l8LInp3. I would encourage you to take a few moments to share your thoughts with the township so they can be considered as we all move forward together. Deacons of Jazz Concert this Saturday, April 30 at 7:00 at Breslau Mennonite Church. A 6-member band, playing a mix of jazz and pop pieces with their own Deacons’ sound. This is a fundraiser for our Refugee Sponsorship. Freewill offering; receipts given for all donations over $20. Coffee, refreshments and great music! Breslau Mennonite Church youth fundraiser garage sale will be held on Saturday May 7, 8:00 am-1:00 pm. They will be hosting this sale at the church rain or shine on Saturday, May 7, 2016. Last year there was lots of big items donated for this sale. So kick off the garage sale season with this event. You can help by donating gently used items, dropped off Thursday May 5, 7:00 - 9:00 pm or Friday, May 6 during office hours. Items at the sale will include: new handcrafted items, baking, perennials as well as various household items. The biggest help you can provide is to come down to the sale and hunt for some bargains, dont forget to bring your neightbours with you. This past weekend you may have had a chance to run into a member of Breslau Mennonite Church handing out post cards like the image above. In the fall of 2014, a group emerged from Breslau Mennonite Church expressing interest in exploring the possibility of a community garden. After doing some research, they decided to commence with a ‘test’ garden to see how the growing conditions were and to see if a community garden could in fact be something to strive for in the future. The summer of 2015 proved to be a very bountiful one for the test garden and planning has persisted throughout the winter to prepare for an open community garden for the residents of Breslau to enjoy. This group is now pursuing interest into the community for people to sign up for a plot. I know that the number of prepared garden plots are limited but if there is interest there could always be an expansion. I would encourage you to check out https://breslaugardens.wordpress.com/ if you are interested in more details on this project. We can literally grow as a community with this project. 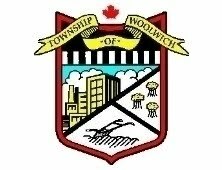 The Township of Woolwich wants to hear from you! 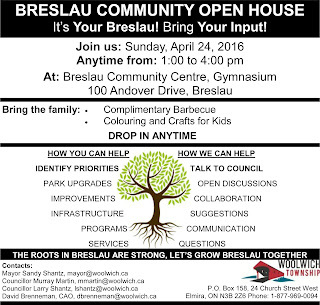 They are hosting an open house to continue the dialog with the people of Breslau on how we want to grow and develop our community. This is not a Riverland / Old Breslau / Hopewell event, this is a Breslau event. I would encourage everyone to make your community a priority and reinforce our resolve to grow and develop into a vibrant neighbourhood. The contacts for this event are Mayor Shantz (mayor@woolwich.ca), Councillor Martin (mmartin@woolwich.ca), Councillor Shantz (lshantz@woolwich.ca), and CAO Brenneman (dbrenneman@woolwich.ca). The township wants to support us as we grow and we need to partner with them for our own success. 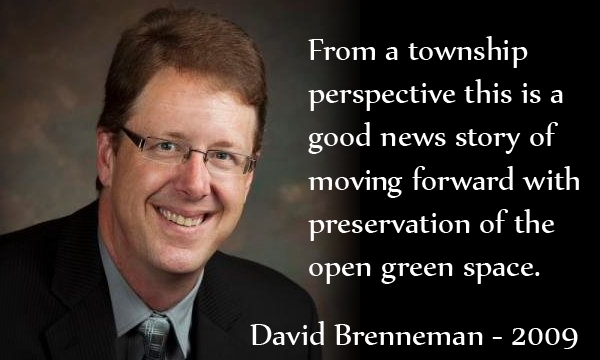 Breslau's future can only be realized with an open and honest partnership with the township. Please make an effort to drop by the community centre from 1:00-4:00 pm on Sunday, April 24th. We are entering into another spring (when nature realizes it is spring), and the Breslau Lions club are preparing to reinvigorate the splash pad project. This project has received many ups and downs but it has also received a lot of support from the community in the past. 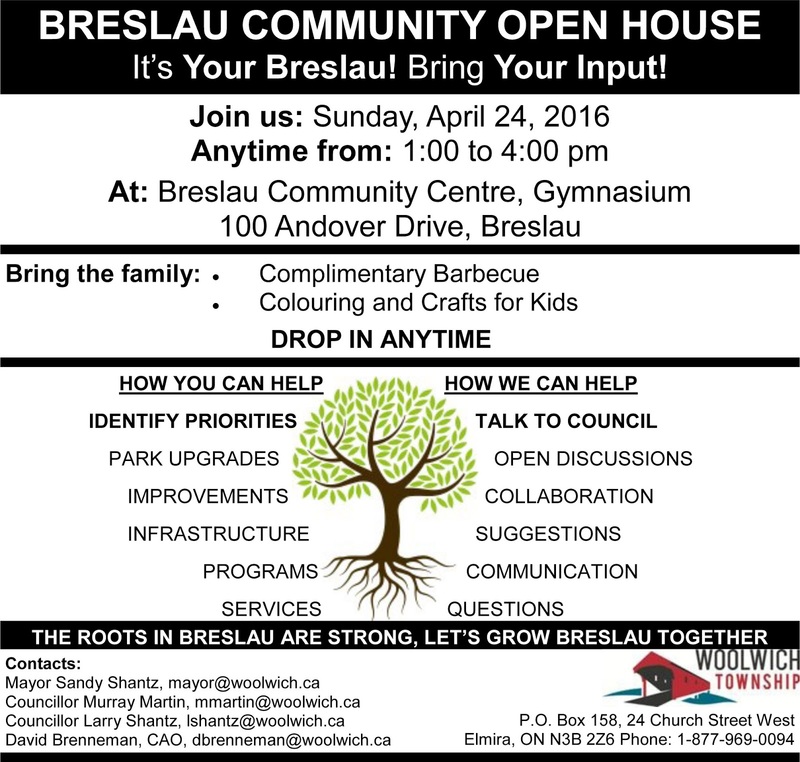 Keep this project in mind as we plan for Breslau's future together. You can check out their facebook page or their website http://www.breslaugrandsplash.ca/ to keep updated on the project. Jeff and Michelle Barnard along with Joanna Brunnenmeir would be your best bet to contact if you want to get involved. I "borrowed" this from the Lions facebook page. Just like any large project worth undertaking things always seem to move slower than you would emotionally like them to. There are a variety of initiatives progressing with this project as we work to build a support network for the eventual family. At this time we have raised the required $30 000 and members of both churches have been formed into several working groups focusing on education, employment support, family finances, healthcare, housing, life support, fundraising, community integration, etc. The majority of the initial paperwork that is required by Mennonite Central Committee (MCC), our sponsorship agreement holder, has been completed; after which we will be placed on a matching list for a family. MCC has indicated that the matching process has slowed down recently but they are receiving profiles on a bi-weekly basis, and currently have 34 groups waiting to be matched. They match based on profile availability and our group’s criteria. Our criteria is a family of 4-6 (ideally 5), and may include young children and/or teenagers. We are open to receiving a refugee family from other countries besides Syria. Even though we have raised the minimum amount of money, we do not yet know the needs that our family will have or what other expenses we may incur. In that light, a fundraising event is planned for April 30, 2015 with the Deacons of Jazz at Breslau Mennonite Church. Stay tuned for more updates. If you would like to share anything with the Breslau community and you would like to use my blog to help make that happen please get in touch with me at matthewlvandermeer2@gmail.com. We are a diverse community and we can continue to find success together if we reach out to each other and grow together. Breslau has experienced rapid growth in the last 5-10 years and we are all learning about each other as we work to build our local community. There are many in our community that are new and there are many who have been here for a very long time. Breslau means something different for everyone, and we all have different expectations for our future. Breslau Mennonite Church has been a part of Breslau for more than 100 years. You have probably driven by and maybe you have even attended a service, dinner, wedding or funeral there. Many things have changed in our community and in our world in that time. I would like to take this opportunity to tell you about a response to recent global events bering undertaken by Breslau Mennonite Church and Bloomingdale Mennonite Church. These two congregations have agreed to partner together on a private refugee sponsorship project for a refugee family of 4/5. The Canadian Government defines refugees as people who are outside their home country or the country where they normally live, and who are unwilling to return because of a well-founded fear of persecution based on: race; religion; political opinion; nationality; or membership in a particular social group, such as women or people of a particular sexual orientation. You have been hearing about 25 000 refugees in the news lately and how the Canadian Government has pledged to settle this number in Canada by the end of February. The first thing that we need to differentiate is government sponsorship vs private sponsorship. For government sponsored refugees the government at all levels and their various agencies are 100% responsible for the well-being of each family. These are the refugees that usually end up housed in military bases or hotels until other accommodations are available. For private sponsored refugees a sponsoring agency or group is responsible for the daily needs of the refugees. The sponsoring group needs to raise a minimum of $30 000 and then commit to ensuring the matched refugee family's daily needs are met for their first year in Canada. The idea behind a private sponsorship is a large support network of individuals (not necessarily government agencies) will do the work to get the refugees settled. This includes but not limited to: housing, education, the search for jobs, arranging health care, ensuring school age children have adequate supplies, food, assisting in social connections with the local communitym and seeking social supports with others sharing similar stories. This doesn't mean that government resources cannot be used but it is up to the private group to apply for and make use of these resources. This private sponsorship will be a part of Mennonite Central Commitee's (MCC) refugee program. As such, it will have the strong suppot from MCC, giving this project a firm foundation. Diversity isn't just sound social policy. Diversity is the engine of invention. It generates creativity that helps change the world. 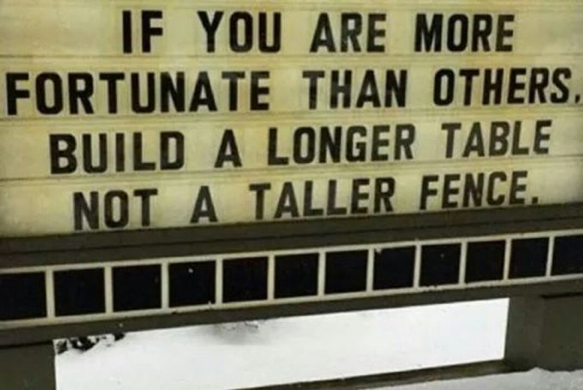 We know this in Canada. The Waterloo Region is well prepared to welcome refugees and a website has been developed (WR Welcomes Refugees) listing a large number of resources available. With this post, I am inviting anyone in the local Breslau community who is interesting in being a part of this initiative to please get in contact with me at matthewlvandermeer2@gmail.com or by contacting Breslau Mennonite Church at 519-648-2501 or office@breslaumc.ca. Sometimes we hear about stories in the news and we want to do something to help, this is your opportunity to help. Breslau Mennonite Church just voted to approve this project this week. This means that the project is in its infancy but we are preparing for a 1-4 month timeline to be matched with a refugee family and have that family arrive in the region. Once we know more about the family and what their needs are we will again be making appeals to the community. The poem to the left was written and performed by Shane Koyczan during the Vancouver 2010 Opening Ceremonies, it tells of a vision of Canada that is inspiring. We are a fortunate people in a fortunate country. We must do what we can to help those who have struggled in difficult circumstances. Woolwich Council stated throughout this process that they wanted to solicit as much feedback as possible on the proposed partnership between the WCDSB and the Township. As outlined in my previous post, we have spent the last year debating this project and soliciting feedback. 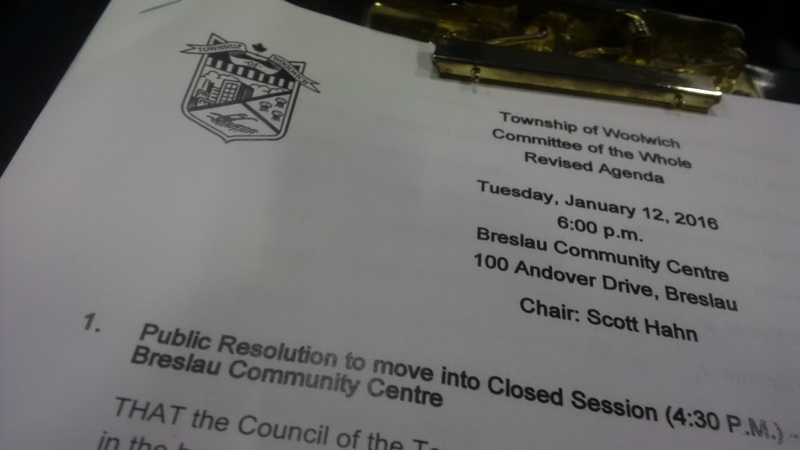 Council decided to hold a council meeting at the Breslau Community Centre on January 12, 2016 as the final debate on this proposal. In total, approximately 60 delegations either spoke or included a written submission to this meeting. Over 80% of those delegations spoke against the project. The meeting was more than 3 hours long and it proceeded quite quickly with very few disruptions. Once the delegations had finished, the tension in the room was thick and emotion got the better of some of the audience as the councillors made their statements. In the end, the council was split and 3 voted for selling the land (S. Shantz, M. Murray, S. Hahn) and 3 voted against selling the land (P. Merlihan, L. Shantz, M. Bauman). A split vote means that the motion fails and the 4-acres of Breslau Memorial Park are not declared surplus and they cannot be sold. Following the vote Mayor Shantz stated that she did not have any desire to bring this up again and council vowed to let this project die and instructed staff to communicate the results of the vote to the WCDSB. In response, the WCDSB sent out a letter to the families at St. Boniface, stating they were disappointed at this result. 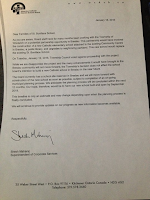 The letter also included information on an alternative option for the new school in Breslau. "The board currently has a school site reserved in Breslau and we will move forward with construction of the new school as soon as possible, subject to completion of an on-going municipal planning process. We anticipate the planning process will be concluded in the next 12 months. Our hope, therefore, would be to have our new school built and open by September 2019." I am happy to hear that the school board has other options and the delay caused by not going forward with the proposed partnership seems to be about 1 year. The question now becomes what next? Residents of Breslau were deeply divided on this project and at times, both sides of the debate crossed a few lines. We are still neighbours and we still need to work to build community. A small group of residents have started some preliminary discussions about how we can move forward. At this time we do not have the answers, we probably don't even know all the questions. We have reached out to the township for direction and we look forward to the ongoing discussions both with Councillors and staff, as well as all residents of Breslau. There will be many opportunities for large numbers of people to get involved as we move forward. For now, we have created a Facebook page to help start the conversations with our neighbours. You can view that page at https://www.facebook.com/BuildingBreslau/. Dialogue and involvement with the entire Breslau community is the only way to ensure success and I look forward to being a part of that success. I hope everyone had a Merry Christmas and you are enjoying a festive end to 2015. It has been quite a year, a year that I will cherish whatever 2016 brings. I have met some amazing people and I have begun to form a bond with the community I live in. My last post was more than a month and a half ago; I was feeling quite discouraged as I attended a variety of council meetings and felt that the newest portion of Breslau Memorial Park would be sold and there was nothing more I could do. As we celebrate the end of 2015 there is suddenly a glimmer of hope. To start things off I want to provide you a year in review summary of the events of 2015 pertaining to Breslau Memorial Park. Persons wishing to appear before a regular meeting of Council or Committee shall notify the Council and Information Services Department no later than 5:00 p.m. on the Thursday preceding the date of the meeting. Generally, all delegations are heard at Committee meetings rather than Council meetings. A person may register to be listed as a delegation on the revised Council or Committee agenda no later than 12:00 noon on the day of the meeting, only if the delegation wishes to address Council or Committee regarding a current agenda item. If you wish to include any handout or presentation materials as part of your presentation, or if you require the use of a laptop and/or projector for your presentation, please contact Council and Information Services no later than 5:00 p.m. on the Thursday preceding the date of the meeting at 519-669-1647 ext. 6115 to advise staff of your requirements. I am encouraging everyone to register and make your voice be heard. Delegations do not need to be long prepared speeches with an excellent punch line. It can be as simple as, "Hello, my name is [name] and I am a resident of Breslau. I [do / do not] support the sale of public parkland to the WCDSB for the purpose of building a school." If you would like to address Council please complete the Online Delegation Request Form or call 519-669-1647 ext. 6115 to register. Personally, my goal is to have 100 delegates registered by January 7, 2016. If you do not speak against this project by stating you are opposed, it will be interpreted as having no opinion. There has been much talk about the "silent majority" and what direction they will support. You need to attend this meeting and register your opinion as a delegation. It is possible for Council to open the floor to unregistered delegations, but you cannot assume this will happen. Council has made a significant gesture by moving this meeting to Breslau, we must respond with our participation in significant numbers. I would like to make clear that a new catholic elementary school will be built in Breslau even if Council chooses to not to sell our future. When council voted against the project back on September 29, 2015. 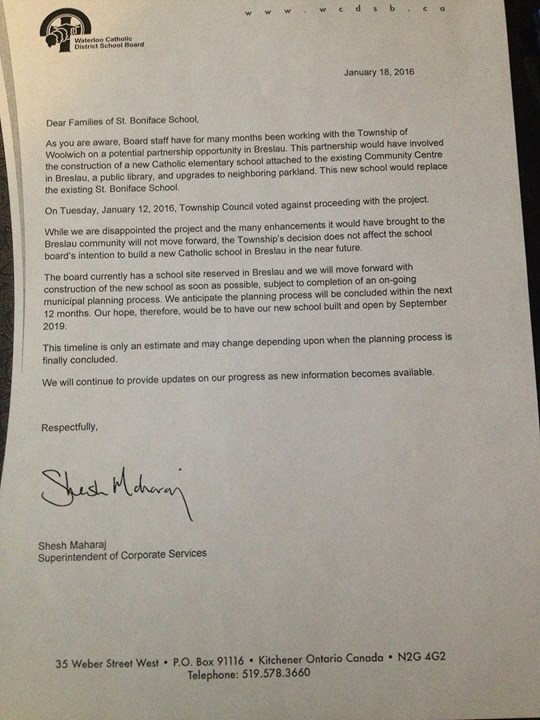 The WCDSB immediately sent out a letter to the current students of St. Boniface, indicating that there were other options and they would be able to proceed with a new plan within 3-5 years. This isn't about a new school, this is about Breslau's future after it grows into a city over the next 50 years. Forests don't grow overnight and they don't grow through school buildings or asphalt playing surfaces. Right now Council has an opportunity to preserve this land when other lands are under used all around Breslau. In the future, the pressure to build will only become more intense and large greenspace parks will be that much more valuable. Please consider registering as a delegate for the meeting on January 12, 2016. We need your support and your involvement now more than ever before. I hope you have a fun and safe New Years eve. While researching specific historical Township of Woolwich policy a friend came across a parkland battle between the Township of Woolwich and residents. I am referring to a battle over about three acres of the park in the area of Synder Avenue, Dunke Street and Victoria Glen Street in Elmira. The image above is a recent google street view of the area. The comparisons between the battle for Victoria Glen and our fight for Breslau Memorial are scary similar. The township was contemplating surplussing a part of these lands for the construction of a subdivision. 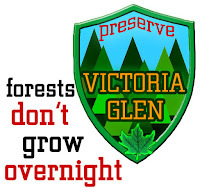 I was able to find a blog entitled Preserve Victoria Glen Park, that supporters of the park were maintaining to convince the township that the short term gain of money was not worth the long term loss of this space. I should note that the Township Council at the time were: Councillor Sandy Shantz, Councillor Murray Martin, Mayor Wm. 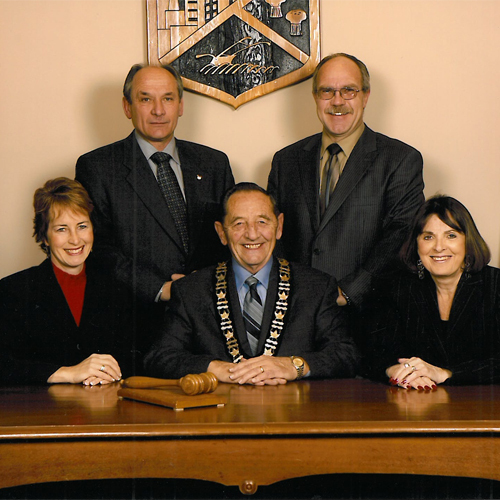 L. (Bill) Strauss, Councillor Mark Bauman, Councillor Ruby Weber. The following are quotes published in the Woolwich Observer that discuss this situation. I have pulled a few quotes from each article if you don't have the time to read them all. “We are the keepers of this land, and we’re doing a poor job of it,” said Ken Reger, who has lived within sight of this area for his entire 76 years. “It’s not just Victoria Glen – it could be any park in town. We have to fight for our green space,” said Orr. CAO David Brenneman after the decision to scrap the project. I was enlightened by reading these stories and I am more than happy with how these residents came together to fight for this space. I was enlightened because I had no idea that this fight was going on, we as a township need to learn more about each other. We can't complain about Elmira until we take the time to understand the issues they are dealing with. The purpose of this post is to connect our struggle with theirs, they won against the shortsightedness of easy money and it looks like we will face the opposite result. I sincerely hope that in the future when the next group of residents takes on short sighted politicians the words that I have written here and the words written by Preserve Victoria Glen Park will give them direction and hope. 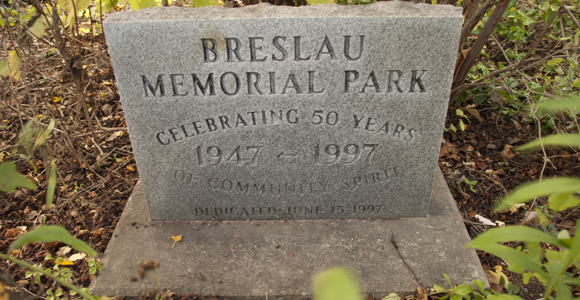 As a Breslau resident you should receive a written notice about the intent to declare 4 acres of Breslau Memorial Park surplus. This is a required step in order to sell the land to the WCDSB. Normally this notice is only sent to homes near the affected area. However, Councillor Bauman requested that this notice be sent to everyone in the settlement area of Breslau. This will be your last chance to voice your opposition. Victoria Glen was saved because of sheer numbers, we need to have a significant response to that notice. That response needs to be from new people and from more people, if you have not made your voice heard, that notice will be your chance (contact the township council). Did you get the Victoria Glen park wrong? Has the years since 2009 made you rethink that project and wish that you would have made an alternate decision? Councillor Martin likes to remind us about the Wal-Mart decision, and the Race Track decision. Why has he not mentioned the Victoria Glen decision? A decision made unanimously by Councillors to scrap this plan that has the highest parallels to our situation.